WorldFest was EPCOT Center’s year-long series of folk festivals with an international leaning. 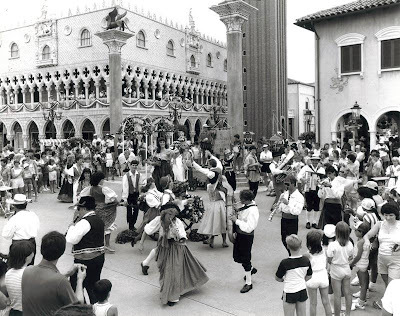 Music, dancing, arts, culture, and culinary sensations were the highlights of the miniature festivals held around the World Showcase promenade between 1984 and 1985. 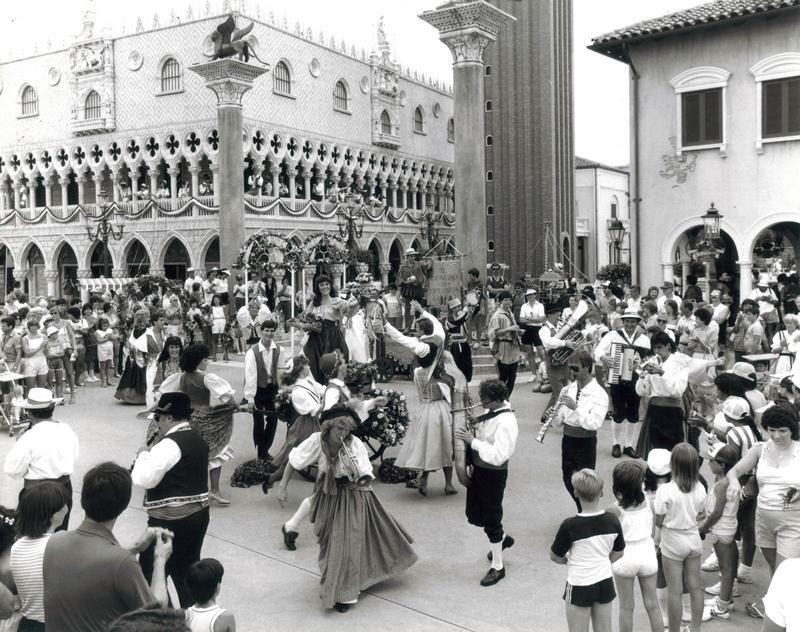 When Italy had its turn on the center of the WorldFest stage in November of 1984 the courtyard, designed to represent Piazza San March, also known as St. Mark’s Square on this side of the Atlantic, was he hub of many of the activities. Aside from the artisans brought in especially for the celebrations, there were gondolier singers from Venice, I’ve been assured that they didn’t row all the way to Orlando from the city on the water, and dancers, flag twirlers, and performers from Messina, Agrigento, Naples, Bologna and Cori. All in all this intimately focused festival, part of the larger WorldFest celebration, would have been anything but a quiet affair. Don’t believe me, just check out the scene below! What a brilliant idea that beautifully captures what World Showcase is all about! I wish they'd bring this back, or expand the scope of the Food & Wine Festival to include more country-specific celebrations.